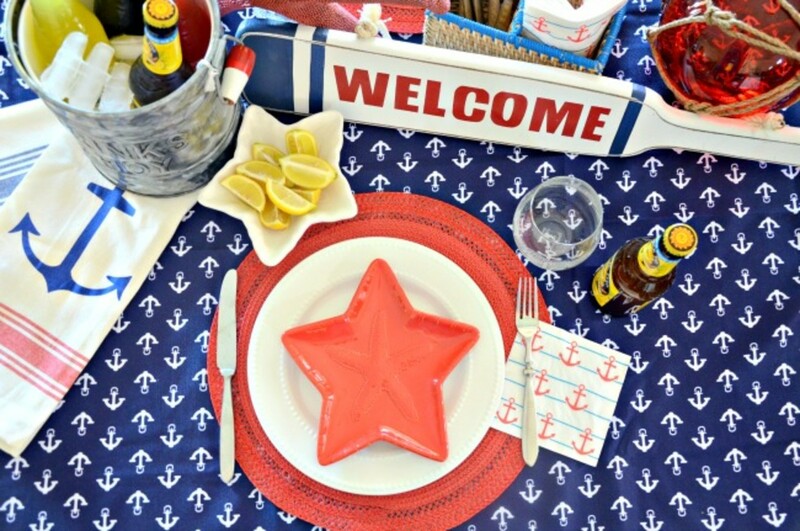 Red, White and Blue Nautical Table Decor for Your Next Summer Party! 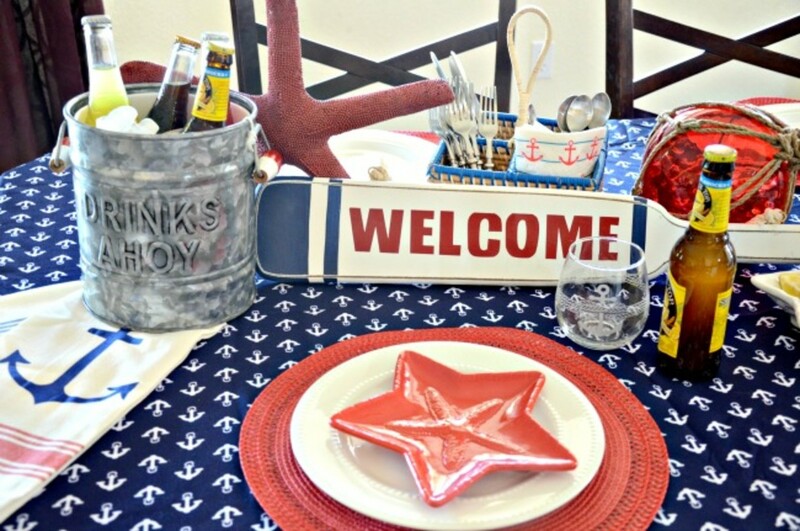 Set the scene for some summer entertaining with these red, white and blue nautical finds from T.J. Maxx and Marshalls. The nautical theme is very trendy this summer. Everyone wants to feel like they are setting sail on an adventure and why not?! I&apos;d love to be on a boat enjoying a freshly caught seafood dinner with family and friends. Sadly, I live in the desert and have no plans of sailing anywhere anywhere soon. 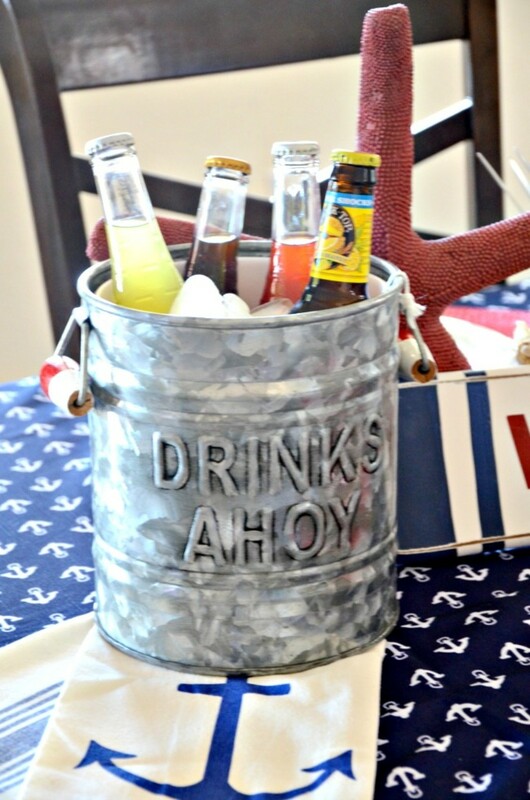 But, I can bring a little bit of the nautical feel to my summertime tabled decor and enjoy a seafood dinner in the comfort of my dining room. Both T.J. Maxx and Marshalls were stocked with some pretty unique nautical finds. The red, white and blue color scheme also flows nicely and can be tied into a 4th of July party too. One of my favorite pieces was the galvanized metal ice bucket. I love the red and white handles and the "drinks ahoy" lettering that is embossed across the front. Fill it up with ice and a couple bottles of your favorite summer drinks. 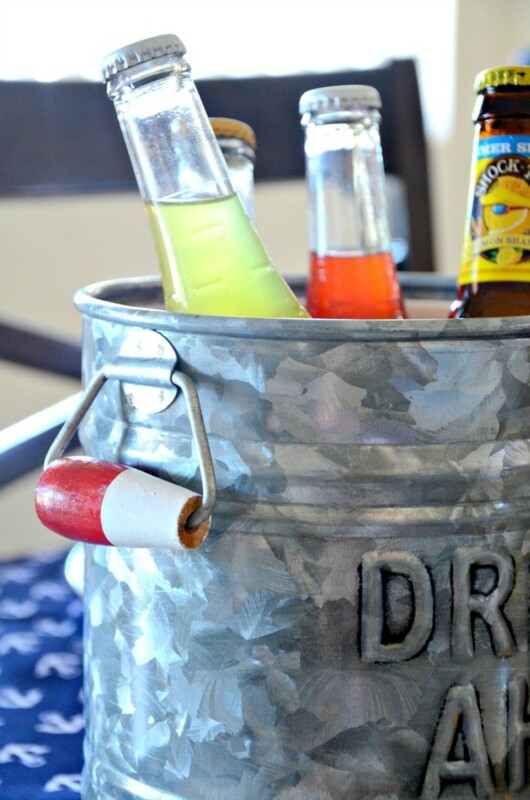 We displayed different kinds of sodas and beer in ours but you could also use it to chill down some white wine or champagne depending on the type of dinner you are hosting. This navy and white anchor tablecloth was the perfect start to setting the table. I set each place setting with a red placemat, simple white plates and a red starfish plate on top for salads or appetizers. We used a similar white star bowl to hold some lemon slices for squeezing on top of your seafood meal. This large red lantern was probably my most useful find. It has a battery operated candle with an optional timer setting! I plan on using this lantern for many more occasions/parties to come. I&apos;m already thinking of ways I can incorporate it into my Christmas decor! 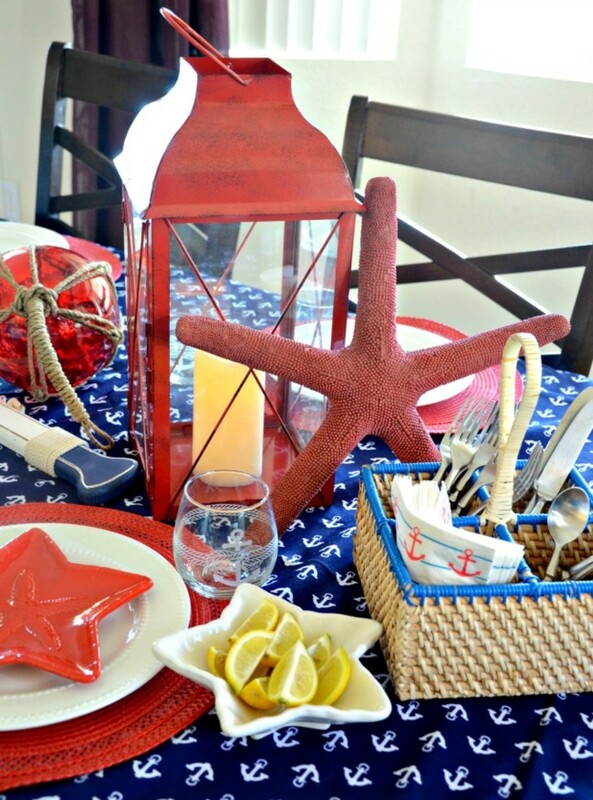 The giant red starfish also tied in the stars from the red plates and added to the nautical/seashore feel. I found a large "welcome" boat oar that was originally a wall decor item but I like it propped up on the table. 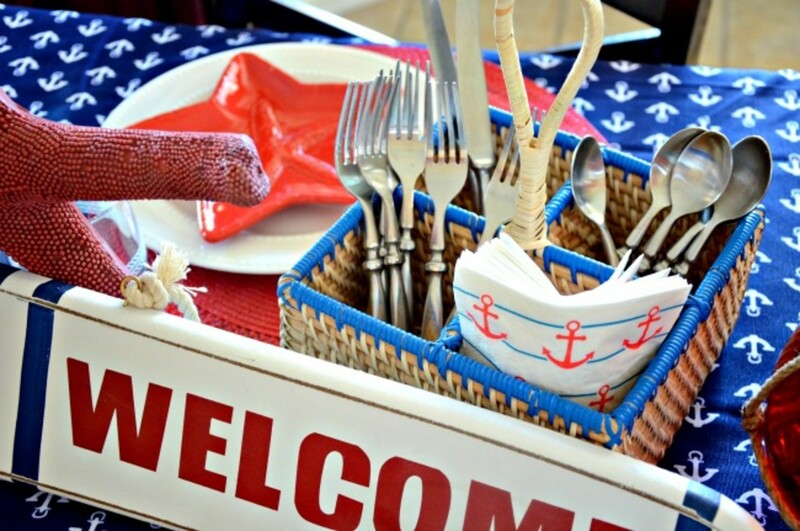 For a bit more casual feel we set our silverware and cute anchor napkins up on a wicker basket trimmed with blue. 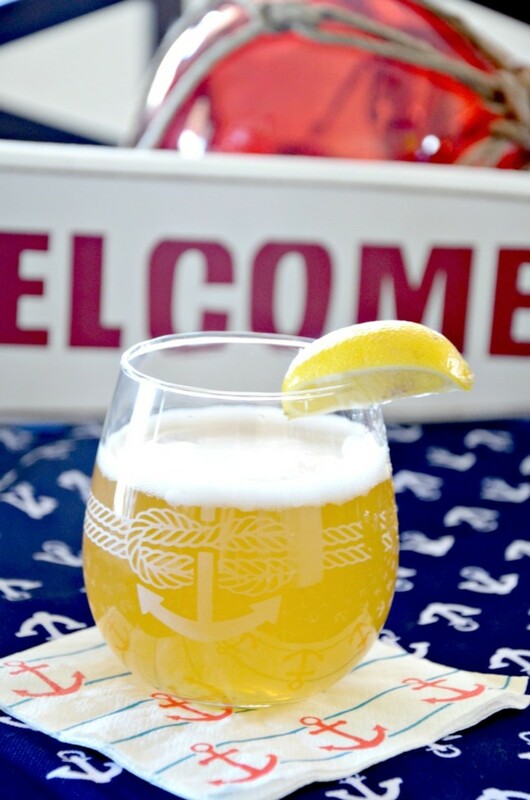 Once your table is set, sit back and enjoy some refreshing lemon shandy or drink of your choosing in these elegant etched glasses with an anchor design. 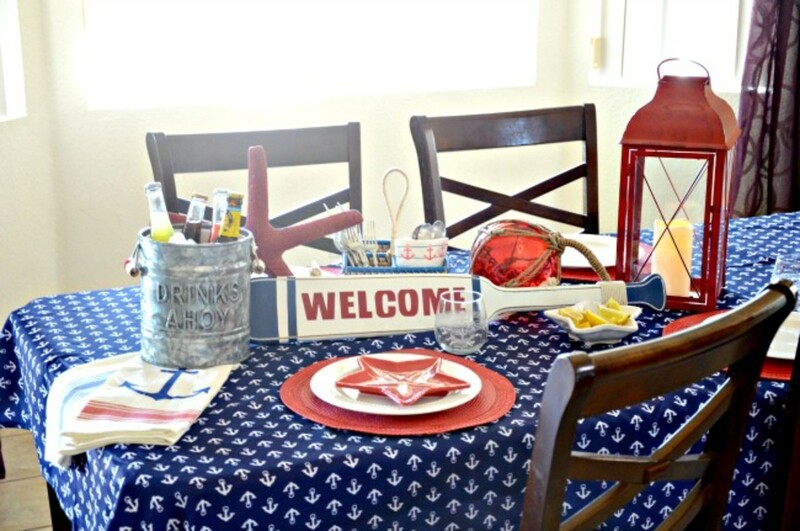 I hope you enjoyed seeing my red, white and blue finds and that this gives you some inspiration for how you can set your own table with a nautical theme this summer!